Bitcoin services company, 21.CO, performed a domain rebranding and became Earn.com. Earn.com, formerly 21.CO, is a new kind of social network where you earn digital currency by replying to emails and completing tasks. We’re excited to announce that 21.co is now Earn.com! Our product is unchanged: you still earn digital currency for replying to emails and completing tasks, and you can still earn tokens for signing up for our token launch later this year. But we think “Earn.com” gets that concept across more quickly than “21.co”, especially to folks who are new to digital currency. The idea behind Earn.com is that we’ve built a positive-sum social network, where every notification is an opportunity to earn money. This is quite different from existing social networks, where notifications are often distracting or even downright negative. Rather than posting something and hoping other people will like it, at Earn.com you complete tasks and reply to messages that others have paid to send. It’s a positive-sum system where everyone comes out ahead, and where progress is measured in the value created for you and others. 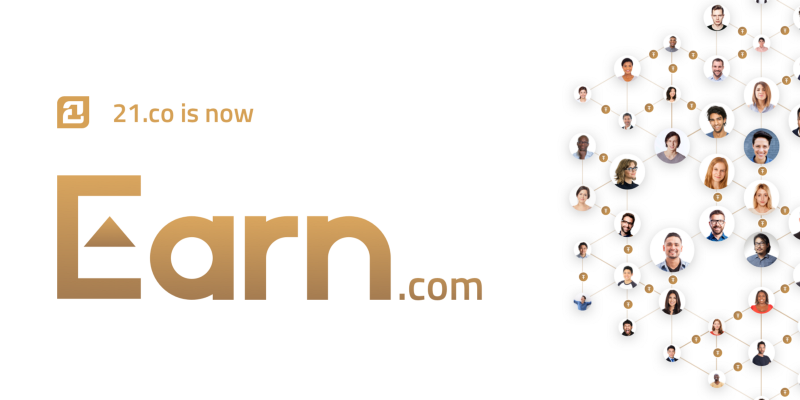 It’s also an important practical application of blockchain technology — rather than mining or buying digital currency, now you can earn it at Earn.com. That started with earning Bitcoin — and we’ll continue to support Bitcoin — but we’ll be adding ways to earn other digital currencies as well, starting with our token. What does the new Earn.com domain mean for existing and new 21.CO users? Effective immediately, Earn.com is the new canonical URL, company, and app name. All profile and list URLs (like 21.co/bhorowitz) will be redirected in perpetuity to their analogs at Earn.com (such as earn.com/bhorowitz). So don’t worry if you’ve linked to your 21.co profile page from your Twitter, LinkedIn, or homepage — that link will continue to work in perpetuity, and you can update it to the corresponding Earn.com link at your convenience. Our token launch remains on schedule for later this year. You can read more about it at earn.com/token. Our logo has been updated. Other website assets remain the same for now, though we may do a refresh in the future. We have discontinued some older URLs, but our open source python libraries will continue to remain available. Our 21.co corporate email addresses will continue to work in perpetuity. This includes our support emails. So support@21.co will work, but you can use support@earn.com going forward. Our blog is at news.earn.com, though news.21.co links will continue to work. You can follow the new domain on Twitter at @earndotcom.